After seeing picture after picture over the last two months of this year’s amazing conditions on the Grandes Jorasses I eventually got chance to sample it for myself. Jack Geldard and Dave Searle were heading up to climb La belle Hélène on the right hand side of the north face of the Grandes Jorasse and had kindly allowed me to tag along with them. It was all a bit rushed but pretty nice to have just caught the end of the weather window and to be stood at the top of the north face 26 hours after arriving in Chamonix. After a very early start from a cramped Leschaux hut we arrived below the route find two parties already starting up it. It was frigging cold - warm temperatures and long daylight hours on the Grandes Jorasses are definitely over. We decided the best course of action was to get the stove out, get some warm cups of tea down us and let the other teams get established on the route. Jack leading the way up the initial ice slopes. You can just see the team above us. Conditions on the face were as good as the hype, perfect névé and ice all the way. Instead of climbing behind the two other teams on La belle Hélène we headed left to climb the Polish/Michto combination which like a lot of the ice routes on the Jorasses this season has seen a lot of ascents. 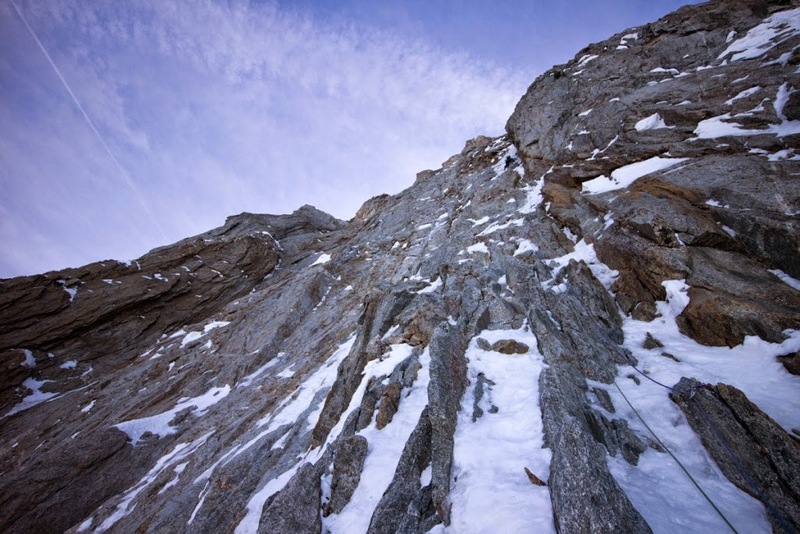 The ice is definitely starting to thin out on some of the steeper pitches which gave brilliant and absorbing climbing. The final pitch of Michto that leads you back to join the Polish route was just awesome. An awkward balancy little mixed step lead out onto a small hanging ice ramp with hundreds of meters of air below you, simply stunning and what these thin ice routes are all about. There were signs of previous ascent everywhere going off in all directions and in the end we just followed the most direct line up finishing up the last couple of pitches of La belle Hélène. A proper combination of routes by the time we got to the top! It was great to be out swinging tools on a big alpine face again and a really fun day climbing as a three. Given it’s now snowing hard down in Chamonix, the quick turn around and rush to make the train was well worth it to grab a route before the weather came in. Thanks to Jack and Dave for letting me come along and Josie for getting all my kit out and ready so I could make the train! Dave leading the abseils down from the summit ridge - we traversed the ridge to join the decent from below Pointe Croz. We found out after there is a direct decent from where La belle Hélène tops out which we were told isn't as bad as it first looks. all content copyright of Andy Houseman. Powered by Blogger.